Attendees included clinicians and researchers from nursing, anesthesia, and surgery (more than half of conference attendees), with representation from the Veterans Health Administration, the American Society of Anesthesiologists, the American Association of Nurse Anesthetists, American Academy of Anesthesiologists Assistants, American Hospital Association, American College of Surgeons, American Society of PeriAnesthesia Nurses, the Joint Commission, Association for the Advancement of Medical Instrumentation, American Society of Healthcare Risk Management, Institute for Safe Medication Practices, and other societies and non-profit agencies. Additionally, malpractice insurers and family members of patients who have died from this complication provided input on the scope and impact of the problem, and representatives from the monitoring technology industry (about one-fourth of attendees) discussed the potential for improved monitoring of patients’ respiratory status in the postoperative period. Should electronic monitoring be utilized to facilitate detection of drug-induced postoperative respiratory depression? If “Yes” to electronic monitoring, who should be monitored (inclusively or selectively) and what monitors/technology should be utilized? Dr. Stoelting opened the conference by asserting that continuous electronic monitoring of oxygenation and/or ventilation may allow for more rapid diagnosis and prevention of drug-induced, postoperative respiratory depression. He commented that we cannot wait for the perfect technology before we intervene, and that “maintaining the status quo in hopes that a different result will occur is unrealistic.” He noted that the goal of the conference was to utilize the available evidence to discern the best monitoring strategies for providing effective early warning of postoperative respiratory depression. Following these introductory remarks, family members of patients who died from drug-induced respiratory depression recounted their loved ones’ medical tragedies. They all noted the lack of monitoring for their loved ones during their last days in the hospital after undergoing elective routine surgery. They implored the group to enact changes immediately that would prevent such future tragedies. After this presentation, Dr. Nikolaus Gravenstein, a professor at the University of Florida, highlighted the remarkable observation that patients having vital signs checked every 4 hours are left unmonitored 96% of the time. He noted, as did many speakers, that supplemental oxygen may mask hypoventilation, and that under these circumstances pulse oximetry is a very late detector of respiratory depression. Lethal hypercarbia is possible despite normal oxygen saturation. He also predicted that the increased emphasis on postoperative pain management by centers that govern reimbursement will undoubtedly result in a higher incidence of opioid-induced respiratory depression. 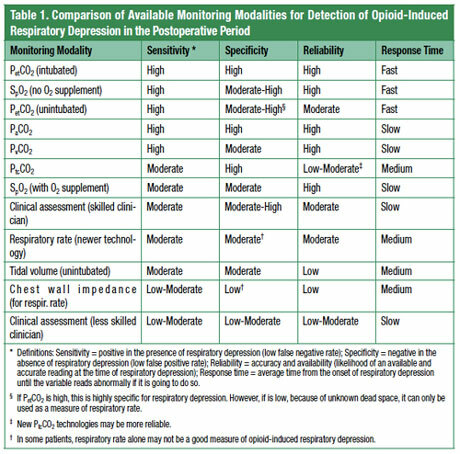 There was not uniform agreement initially regarding selective versus universal monitoring, or risk stratification, for patients receiving postoperative opioids. Several speakers discussed coexisting conditions and diseases associated with postoperative drug-induced respiratory depression including obesity, sleep apnea syndromes, advanced age, organ system dysfunction, concurrent CNS depressant use, and preoperative chronic opioid tolerance. Many of these risk factors (especially obesity) have been increasing in the general population. Yet, some of these conditions that predispose to opioid-induced respiratory depression may be undiagnosed in the surgical patient. In particular, Dr. Frances E. Chung, professor of Anesthesiology at the University of Toronto presented data showing that over three-quarters of men and women with moderate to severe sleep apnea are undiagnosed, with a 7-22% prevalence.5 Therefore, risk stratification for increased postoperative electronic monitoring would potentially miss a large population of patients that is at increased risk for opioid-induced respiratory depression. Further data from Dr. Chung demonstrated that monitoring patients postoperatively for respiratory depression may entail more than one or two nights after surgery. Her data showed that the apnea-hypopnea index (AHI) in sleep apnea patients is highest on the third night after surgery and remains above the preoperative baseline out to the seventh postoperative night.7 Further research is needed to determine if the type and duration of surgery and anesthesia impact these findings. It remains unclear how to best monitor severe sleep apnea patients after procedures that would be considered outpatient surgery. Dr. Scott F. Gallagher, associate professor of Surgery from the University of Florida in Tampa, FL provided data showing that bariatric sleep apnea patients will have severe prolonged hypoxemia even with their continuous positive airway pressure (CPAP) in place.8 Consequently, monitoring of oxygenation and ventilation is still needed in these patients postoperatively, even when they are using CPAP. Dr. J. Paul Curry, clinical professor of Anesthesiology at the University of California in Los Angeles David Geffen School of Medicine, and staff anesthesiologist at Hoag Memorial Hospital Presbyterian in Newport Beach, CA, and Dr. Larry A. Lynn, a pulmonary intensivist and the executive director of the Sleep and Breathing Research Institute in Columbus, OH, presented unique data describing 3 different patterns of unexpected hospital deaths. These patterns included progressive metabolic acidosis (e.g., sepsis), opioid-induced carbon dioxide narcosis, and drug-induced arousal failure with sleep apnea (see article). They showed different trends in pulse oximetry values, minute ventilation, respiratory rate, and arterial carbon dioxide levels associated with each of these 3 patterns of death.9 They noted that health care providers are not well educated about these patterns and may miss early warning signs. Further, they believe that monitors with threshold alarms (i.e., alarm upon reaching a specific value) are not useful because of their inability to distinguish meaningful from nuisance alarms, depending on the death mechanism. They also discussed that early detection of deteriorating patient conditions will be poor when threshold alarms such as pulse oximetry are set to lower values to reduce the incidence of “false” alarms. Drs. Curry and Lynn encouraged industry to develop smart technologies that could detect the specific patterns of vital signs preceding these types of death and alert care providers. In agreement with the use of smart technologies for pattern recognition, Dr. Richard E. Moon, Professor of Anesthesiology and Medicine at Duke University, suggested that multimodal monitoring was necessary to detect postoperative, drug-induced respiratory depression. He believed we could incorporate the technology used with automated implantable cardioverter-defibrillators (AICD) that utilize complex time-dependent pattern recognition algorithms based on reference waveforms. Dr. Mark R. Montoney, MD, MBA, Executive VP and CMO, Vanguard Health Systems, Nashville, TN, concurred that smart technologies must be developed that can reliably detect early progression of clinical instability and trigger prompt caregiver responses. Dr. Elizabeth A. Hunt, a pediatric intensivist from John Hopkins University School of Medicine also observed that progressive types of multimodal monitoring for vital signs that could be incorporated to identify patterns and percent deviation from baseline vital signs would be useful to provide early detection of deterioration in the pediatric setting. David A. Scott, MB, BS, PhD, Associate Professor of Anaesthesia at St. Vincent’s Hospital in Melbourne, Australia, presented data showing the importance of the assessment of sedation level in preventing ventilatory impairment from opioids. He noted that opioids affect consciousness (sedation), airway tone, and central respiratory drive and that monitoring strategies should address all of these parameters. He again espoused the importance of assessing trends. Consistent with Dr. Scott’s presentation, Chris Pasero, RN-BC, a pain specialist from El Dorado Hills, CA, also commented on the importance of nurses being able to assess and document sedation levels as part of a multimodal monitoring strategy to detect drug-induced respiratory depression. Some audience members suggested that sedation should be the sixth vital sign. Ms. Pasero also advocated for individualized pain treatment strategies with an emphasis on multimodal analgesia. Steven R. Sanford, JD, president and COO of Preferred Physicians Medical, discussed that one-third of their 96 malpractice insurance claims involving postoperative respiratory arrests focused on allegations of drug-induced respiratory arrest resulting in death or brain damage. Another third of this subset of claims involved patients with obstructive sleep apnea with inadequate monitoring alleged by expert witnesses or reviewers. Dr. Robert A. Wise from the Joint Commission (JC) discussed the rigorous process for translating a patient safety issue into a National Patient Safety Goal or Standard. The JC focuses on one to two safety issues each year so that the importance of each issue is highlighted. He noted that educational publications by accrediting or standards-making bodies can be accomplished more quickly. Timothy W. Vanderveen, PharmD, MS, from CareFusion, Roger S. Mecca MD, from Covidien, Catherine W. Parham, MD, MBA, from GE Healthcare, Michael O’Reilly, MD, MS, from Masimo (and a professor of Anesthesiology and Perioperative Care, University of California, Irvine), David Lain, PhD, JD, FCCP, RRT from Oridion Capnography, and Andreas Bindszus from Philips Healthcare all provided their thoughts on continuous electronic monitoring to prevent drug-induced respiratory depression in the postoperative period. These industry leaders updated the audience on the currently available monitors of oxygenation and ventilation. Pulse oximetry monitors wired to a central location with alarms, nasal capnography monitors that alert providers, pulse oximetry and/or capnography monitors integrated into PCA pumps that can alarm and halt the delivery of further opioid, and acoustic monitors of respiratory rate coupled with pulse oximetry that alert providers of abnormal situations were all discussed. One of the recurring concerns noted by multiple speakers was the issue of “alarm fatigue” in nurses due to frequent false positive alarms, often caused by displaced monitoring sensors or artifact, but also from threshold alarms set at levels to minimize false negative outcomes (i.e., no or late alarm in a deteriorating patient). Frequently unreliable monitors can result in delayed or no response from rescuers (e.g., nurses) when real events occur. Many speakers and audience members implored industry to develop multimodal monitors that would be able to detect patterns from multiple vital signs, and theoretically, prove more reliable. Following the formal lectures, audience members were assigned to breakout groups to reach consensus on the two questions posed at the opening of the conference. Summaries of their group sessions were provided by the group leaders to the reassembled participants. There was excellent agreement across all groups that electronic monitoring should be utilized to facilitate detection of drug-induced postoperative respiratory depression. Similarly, most groups believed all patients receiving postoperative opioids should be monitored continuously, but that this process may need to be implemented in a graded fashion because of resource limitations. The duration of monitoring recommended, particularly in light of Dr. Chung’s presentation, was not clear. Additionally, management of outpatients postoperatively was not adequately addressed at this meeting. There was very good agreement between groups that pulse oximetry should be utilized for monitoring as many patients as possible because of its existing wide availability, ease of use, and provider familiarity. However, if supplemental oxygen was being used for patients, then most groups believed capnography should also be applied to patients to detect hypoventilation. Some groups believed that an electronic central observation area for the monitors and alarms would be useful. Improved education and assessment of sedation level by nursing was also noted by many groups as desirable. A few audience members believed that taking action on this patient safety issue was premature because there was sparse evidence-based medicine demonstrating that increased monitoring improved outcomes. They believed that more research was needed to devise more reliable monitors with outcomes studies before recommending these costly interventions. Most conference participants acknowledged the legitimacy of this concern, but believed the continued loss of lives from this preventable complication warranted immediate intervention with the best available monitors until superior monitors were developed. During the question and answer session, Dr. Steven F. Shafer, editor-in-chief of Anesthesia & Analgesia, urged everyone to study the outcomes of any new monitoring initiatives. Dr. Mark A. Warner, ASA President, offered to facilitate implementation of these recommendations by having ASA work with key nursing and surgical groups. In summary, the consensus of conference attendees was that continual electronic monitoring should be utilized for inpatients receiving postoperative opioids. When supplemental oxygen is not being used, pulse oximetry was thought to be the most reliable and practical monitor currently available. If supplemental oxygen is added, then monitors of ventilation (e.g., capnography) were thought to be necessary to detect hypoventilation. Improved education of all care providers on the dangers of postoperative opioids, and better assessment of sedation level were thought to be critical steps in the prevention of postoperative drug-induced respiratory depression. It was acknowledged that limited resources may result in a staged implementation of continual monitoring strategies with the highest risk groups being monitored first, but with the goal of monitoring all inpatients receiving postoperative opioids. Risk stratification was shown to be insufficient to eradicate postoperative opioid-induced respiratory depression. Preventable deaths and anoxic brain injury from unrecognized opioid related sedation and respiratory depression remain a serious and growing patient safety concern. The issues identified and the actions recommended by this group should mitigate these risks with the goal to eventually eradicate this cause of preventable patient harm. A summary of the conclusions and recommendations from this conference can be found at the APSF website at https://www.apsf.org/announcements.php?id=7 or by clicking on the link under Announcements at www.apsf.org, and a brief Meeting Report of the proceedings of the conference will be published in Anesthesia and Analgesia (in press). Dr. Weinger is the Norman Ty Smith Chair in Patient Safety and Medical Simulation, and Professor of Anesthesiology, Biomedical Informatics, and Medical Education at Vanderbilt University School of Medicine and a Senior Staff Physician Scientist in the Geriatric Research Education and Clinical Center (GRECC) in the VA Tennessee Valley Healthcare System. Dr. Lee is an Associate Professor in the Department of Anesthesiology and Pain Medicine at the University of Washington and Co-editor of the APSF Newsletter. Weinger MB. Dangers of postoperative opioids. APSF Newsletter 2006-2007;21:61-7. Fecho K, Freeman J, Smith FR, et al. In-hospital resuscitation: opioids and other factors influencing survival. Therapeutics and Clinical Risk Management 2009;5:961-8. Looi-Lyons LC, Chung FF, Chan VW, et al. Respiratory depression: an adverse outcome during patient controlled analgesia therapy. J Clin Anesth 1996;8:151-6. Shapiro A, Zohar E, Zaslansky R, et al. The frequency and timing of respiratory depression in 1524 postoperative patients treated with systemic or neuraxial morphine. J Clin Anesth 2005;17:537-42. Maddox RR, Oglesby H, Williams CK, Fields M, Danello S. Continuous respiratory monitoring and a “smart” infusion system improve safety of patient-controlled analgesia in the postoperative period. In: Henriksen K, Battles JB, Keyes MA, Grady ML, editors. Advances in Patient Safety: New Directions and Alternative Approaches (Vol. 4: Technology and Medication Safety). Rockville (MD): Agency for Healthcare Research and Quality (US); 2008 Aug.
Gallagher SF, Haines KL, Osterlund LG, et al. Postoperative hypoxemia: common, undetected, and unsuspected after bariatric surgery. J Surg Res 2010;159:622-6. Lynn LA, Curry JP. Patterns of unexpected in-hospital deaths: A root cause analysis. Patient Safety in Surgery 2011;5:3. Galhotra S, DeVita MA, Simmons RL, et al. Mature rapid response system and potentially avoidable cardiopulmonary arrests in hospital. Qual Saf Health Care 2007;16:260-5. Taenzer AH, Pyke JB, McGrath SP, Blike GT. Impact of pulse oximetry surveillance on rescue events and intensive care unit transfers: A before-and-after concurrence study. Anesthesiology 2010;112:284-9.